Usually considered one of the most important books in economics, Henry Hazlitt's classic, Economics in One Lesson, is an easy-to-read introduction to the concepts of economic liberty. This manifesto of free market economics has taught millions sound economic thinking. Written in a very lucid manner and revolving around the central theme of free markets, the book is as simple to read and understand as compelling and profound it is in its logic. The hardheaded, sensible and resonable way used to deal with the basic economic principles makes it clear that economic idealism which entails in expansion of government's intervention in markets often results in tyranny,corruption and ultimately waste of resources, impoverishing the majority. The logics presented are based on the common senses and basic economic principles and hence even the most determined anti-free market activist can't afford to ignore them. 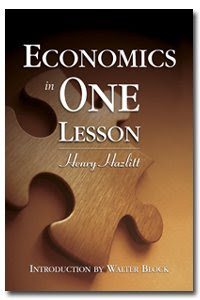 The book was written when Hazlitt was an editorialist at the New York Times with the hope of creating a book on economics that would boil down all the principles of economics into few simple lessons that even layman would understand and never forget. Fortunately, the book has proved to be successful in its intent. The book was written based on some stories by Bastiat and it was the book that made the the idea of the "broken window fallacy" so famous.A must read book for anyone interested in understanding how economy works and thinking like an economist. Besides, after reading the book , you will think twice regarding the economic decisions being made around you. अनुभव गर्नुहोस् चिनिया ईन्टरनेट सेन्सर्शिप को !